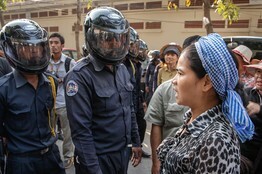 PHNOM PENH, Cambodia—A nationwide strike in Cambodia’s garment industry petered out Monday after a violent weekend crackdown on political and labor protests, allowing most factories to resume production. The fizzling of one of Cambodia’s largest strikes in recent years brought relief for many garment manufacturers, who have complained of mounting financial losses because of missed shipments and lost orders. The strike—started Dec. 24 by tens of thousands of workers demanding higher wages—also stoked concerns over a widening fallout for this Southeast Asian economy that relies heavily on garment manufacturing as its main export earner and biggest formal-sector employer. 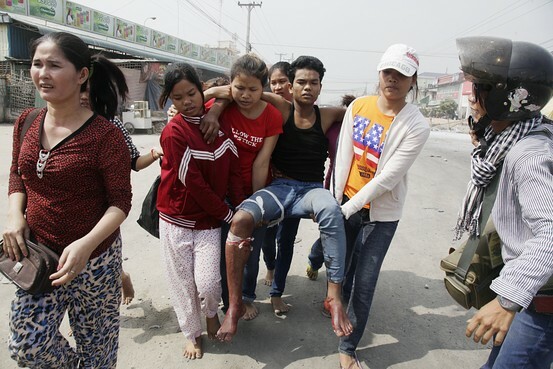 Union officials and workers halted their protest after police on Friday opened fire on a labor demonstration, killing at least four people and injuring dozens more. Authorities also arrested 13 workers before extending the crackdown to opposition supporters, dispersing them from their main rallying point in the capital on Saturday and banning further protests indefinitely. Opposition leaders and rights groups have condemned the violence, but labor and industry officials credited the crackdown for ending the strike. “Most, if not all, factories reopened today [Monday], though only about 50% to 60% of workers came back,” said Ken Loo, secretary-general of the Garment Manufacturers Association in Cambodia, which represents roughly 600 factories. “Many workers had gone back to their hometowns to avoid trouble, but they should be returning over the next few days,” he said. Oum Mean, secretary of state at the Ministry of Labor, estimated that roughly 80% of factories were open Monday, excluding those in the vicinity of Veng Sreng Boulevard—the site of Friday’s shootings. The strike started as a protest against the government’s offer last month to raise the industry minimum wage 19% to $95 a month, starting in April—well short of union demands for $160 a month. Workers then scorned a sweetened offer made by officials last week—a 25% increase to $100 a month, starting in February—and defied government orders to return to work by Jan 2. The Asia Floor Wage Alliance, a group of trade unions and labor rights activists, estimates that a living wage for Cambodian garment workers should be $283 per month. Garment manufacturing is Cambodia’s biggest export business, supplying apparel to retailers mainly in the U.S. and European Union. The industry earned nearly $5.1 billion in the first 11 months of 2013, up 22% from the period in 2012, according to the Commerce Ministry. Cambodia has about 800 garment and footwear factories that employ about 600,000 workers, mostly women, labor officials say. Manufacturers favor the country for its low-wage costs, but strikes are frequent because of what union leaders say is widespread discontent with meager salaries, poor working conditions and lax enforcement of labor laws. Industry officials say it is difficult to gauge financial impact from the latest strike, though a rough assessment—based on historical export data and the number of working days lost—suggests that garment makers may have lost hundreds of millions of dollars in output. Many factories have temporarily shifted production out of Cambodia while others may be considering a longer-term relocation, said Mr. Loo, the industry association official. “Besides loss of production time and costs incurred on making alternative production and shipping arrangements, there are intangible costs as well,” such as reputational damage, he said. Broader economic impact, however, should be limited barring any fresh flare-up in labor unrest, economists say. Chan Sophal, president of the Cambodian Economic Association, said he still expects economic growth in 2013 to come in at roughly 7%, as many had projected before the strike. “If the risks don’t recur, growth could be maintained at roughly 7% this year,” he said.